"As usual Khimia's participants are Russia's largest companies such as PhosAgro and Uralkali which are the core of the Russian chemical industry and have a major share of our export. At the same time, there are companies related to specialty chemicals. We have a great deal of work in this filed as well as a great potential. We are now succeeding in bringing together things that used to exist separately before: research, higher education and some enterprises. Our research centres not only train specialists but also take part in creation of production facilities. It is very important. I believe that Khimia will keep becoming more interesting, advanced and promising year after year." 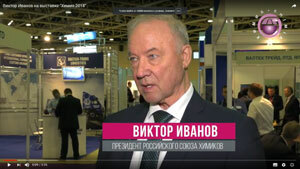 "I have walked around the show and noticed that there are a lot of stands showcasing products for chemical engineering, laboratory and reactive chemistry. One of the biggest advantages of Khimia is that it offers a lot of supporting events. There are a lot of visitors. A lot of people want to go to the Moscow International Chemical Forum we are organising. Round table discussions will be held every day. The trade show gives a chance to meet everyone, look around and network. There are a lot of real professionals working at the stands. Year after year Khimia brings something new and shows the life of the chemical community. The people who work in Expocentre are very passionate about their job. You can ask them anything and they will definitely help you." "We make natural fertilizers. We do our best to take part in every edition of Khimia. This year we are both exhibiting here and taking part in a conference programme. Here we have an opportunity to have talks with our partners and find new clients. Our company is always very meticulous about our stand. We believe that the appearance is very important for the company's image. We try to bring something new every year. This year it is an interactive map which attracted a lot of attention of the visitors, both students and representatives of different companies. 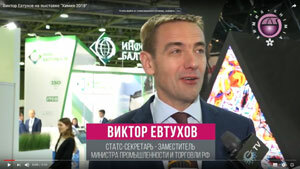 We think Khimia is one of Russia's leading events of our industry. It brings together all market players. We will definitely come back next year." "We are a regular participant in Khimia. It is a milestone event for us. We present a wide range of products which are used in different sectors related to the chemical industry. Here we can tell visitors about our activities, show ourselves to our clients, and meet partners to discuss deals. 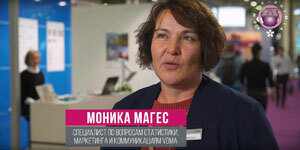 Every year we try to involve new personnel and tell about our new products and developments so that everyone who wanted to get the information could do it. We also try to take part in supporting events to make the best of our participation in the show. It's worth noting that the visitors here are professionals interested in new partners and sales leads. I would like to thank Expocentre for this great event and assistance in building the stand." "Our company takes part in Khimia every year because it covers the field our magazine covers. Here we have an opportunity to meet and talk to our clients, readers and partners about cooperation and content of our magazine and what can be improved. First of all, it is worth mentioning that here we find authors for our technical articles. These articles are what our audience is looking for in the magazine. We show our magazine at the stand. This way a client can make a decision about cooperation because they can see our magazine and its content. We think that it is very important that not only the industry's leading enterprises showcase here but also companies that provide services for it and help it to carry on. Expocentre organises trade shows which are very important for us. We are always making our best to take part in them. It is like the second office for us. We would like to thank Expocentre's personnel for their work." "We take part in Khimia every year. We specialize in developing filtration technology in different sectors of the chemical industry. This event helps us to network with our target audience, hold business meetings, tell the visitors about our activities. Here we also have a great opportunity to research the market. It is worth noting that the people who come to our stand are very diverse starting from engineers to CEOs. They also come from different countries. Our ROI is great because we get a huge number of new sales leads and contacts. The supporting programme shows us the present state of the industry, new products and current problems of some companies. We would like to thank Expocentre for their great work. The trade show is managed very well." "We have been participating in Khimia for over 10 years. Every year our stand becomes bigger. Now it is an interactive stand with equipment, which allows our visitors to see machinery from inside to understand how it works. Visitors come from many different regions. They have different job functions and are interested in our products. We also take part in other events of Expocentre. Next year we are going to participate in Khimia again." "It is the 21st time that our company takes part in this trade show as part of the German pavilion. The total space occupied by our sector is 300 sq m. There are 17 companies at 12 stands. Only the target audience comes here. The visitors ask specific questions which makes the work here very effective. I'd like to mention the great work done by Expocentre. Everything is top notch. The location of Expocentre is especially important. It is very easy to reach it using public transport. We will come back next year."